Ten frames are a great way for kids to develop number sense! While kids are building and taking apart numbers on a ten frame they are starting to visualize what numbers really represent. This understanding is the first step in being able to explore numbers and relate them to each other–key math skills for young kids. 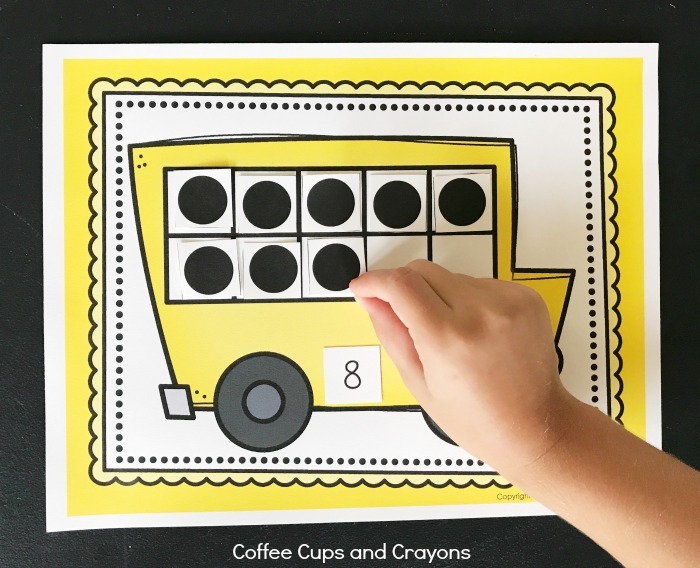 This free printable school bus ten frame activity is a fun way for preschoolers, kindergartners and first graders to play and learn about numbers and counting! This ten frame learning activity is super easy to prep and can be used again and again! 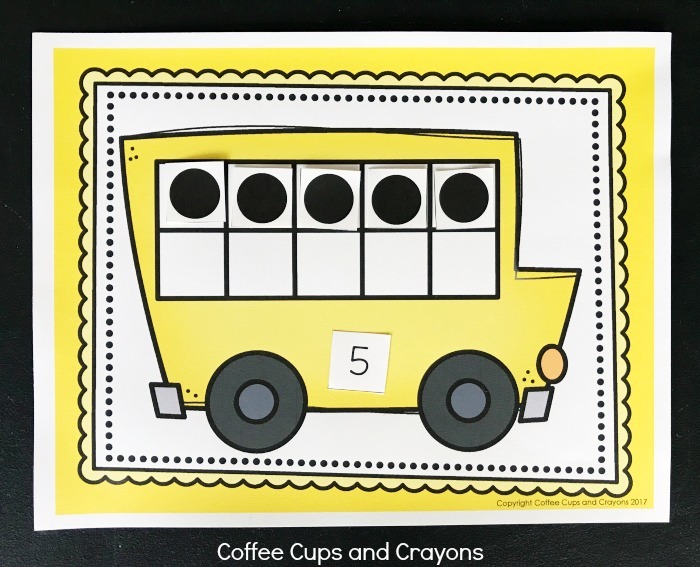 It’s super easy to prep this printable school bus ten frame activity. All you need is a couple minutes! 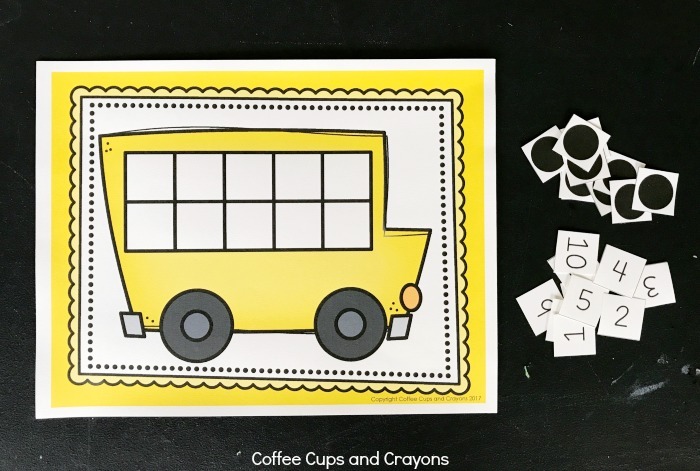 Print the school bus ten frame printables on card stock. Cut out the numbers and the counters. Laminate the pieces for durability. Place in a gallon size resealable bag or pencil pouch for storage. 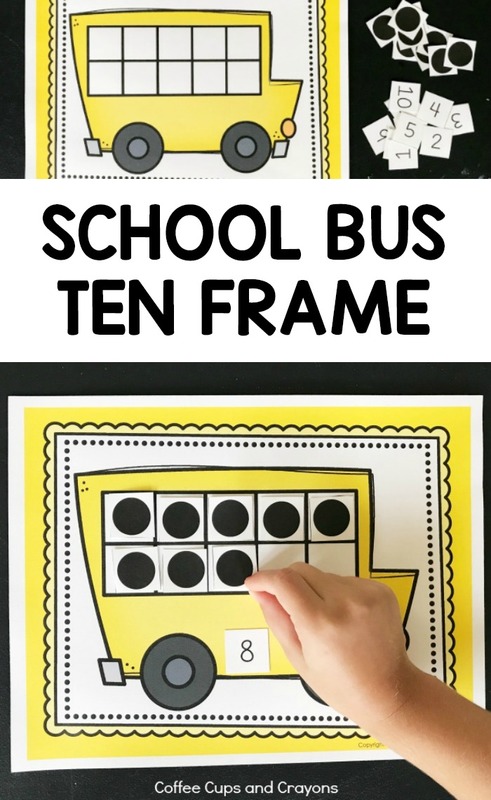 The simplest way for kids to learn about numbers with this school bus ten frame is to have them choose a number and fill the frame with the corresponding number of dots. They start at the top left and fill the dots across the top row and then the bottom. This is a great way for them to start to “see” what numerals represent. Once kids grasp how to use the printable ten frame to show numbers they can start to compare different numbers to each other. You can even print a second copy of the bus for them to use! The printable school bus ten frame is also a great tool for simple addition and subtraction practice. Kids can use the counters to combine and separate numbers. This is a great way for them to start to develop the number sense needed for mental math activities. 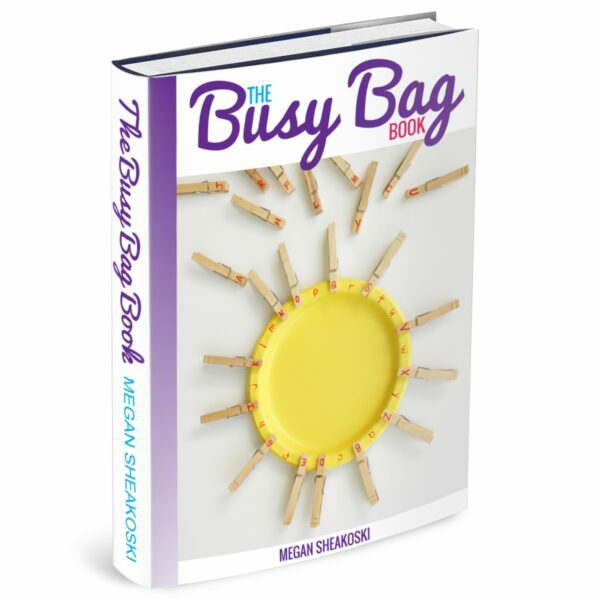 If you love playing and learning with hands-on busy bags as much as we do then you’ll LOVE our ebook! Hi Dear! I couldn’t find the link to Printable School Bus Ten Frame Activity. Ummmmm! I forgot to add it! THANK YOU!!!!!!!!!!!!!! Updating it now! How cute and a great resourse, thank you!